This is the nicest raw beachfront lot I’ve stepped onto in a long time. Warm breezes clear the scant, broken clouds, opening up a big blue sky. The sea is blue turning turquoise as gentle waves roll in. It’s a picture-perfect vista and setting. The beach stretches as far as the eye can see. Sandy points frame the horizon in both directions. In the distance giant dunes dominate the landscape. This beachfront lot is like a little oasis. Wild-growing palm trees sway. Colorful flowers crawl up walls and sprout from hedgerows. This is just the type of situation where real estate investors need to be discreet. Because of the limited supply situation, a small amount of outside interest could be a significant driver of values upward. It’s surprising that this opportunity hasn’t been discovered by more people yet. For a start, this isn’t in some backwater. We’re just two-and-a half hours away from Fortaleza, one of Brazil’s richest cities, and home to a glimmering boardwalk and exclusive $5 million condos. A new international manufacturing hub is expected to create 100,000 new jobs two hours down the road. 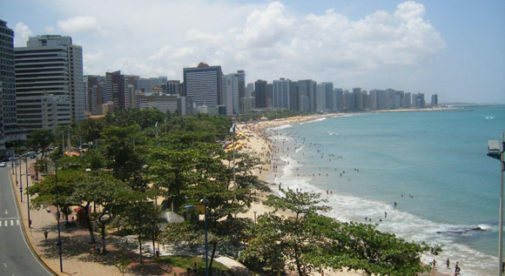 Close to that hub, you’ll also find the beach town of Cumbuco where luxury condos sell for more than $500,000. The town I’m in now, with its beautiful beachfront lots, is the closest town in the area to the nearby wind farms. But, sheltered in lush vegetation and located right on the empty beach, this certainly doesn’t feels like a frontier energy town. It’s a tropical paradise. Fortalazeans haven’t caught on to this little place. Ten years ago there was nothing but a local fish restaurant here—but the area is starting to take off. One beachfront mansion is under construction. The rest of the beachfront is dotted with pousadas (hotels) and restaurants. Their owners came from France, Italy, and Switzerland. You pretty much walk straight off the beach into the main, very clean and tidy, town square. It consists of cobblestone streets…and a pleasant, but small, open plaza—typical of beach towns along this coast. Little streets branch off from the main plaza leading to little houses, home to both traditional fishermen and expats, all making the most of their tropical gardens. This beach town is bordered to one side by a wide river entering the ocean and those wind farms. Past the town on the other side you also have protected lands and more wind farms. Development can’t sprawl along the coast. The French were the first to come. They opened little cafés and restaurants. Then one French guy bought land and sold lots to his friends back home. More French came. They brought their love of the finer things. That’s why it feels classy—even when you are driving on dirt roads around town. This beach town could explode very soon—just like I have seen happen to other beach towns along this coast. Right now a block or two back from the beach and in the middle of this picture perfect beach town, members of my Real Estate Trend Alert could buy a small lot for as little as $20,000. Europeans came because this is a stunning curve of beach and a charming little fishing village. They brought this classy touch. Now the wealthy from Fortaleza are set to catch on that this is a place that’s quiet and private, but which also has the chic amenities that the Europeans created. Members of my Real Estate Trend Alert have done extremely well in this area of Brazil…and you could, too. I’ll be bringing members of Real Estate Trend Alert more details on this opportunity and others like it as I uncover them. You won’t hear about these deals and opportunities—or about the special members-only pricing and terms I negotiate—anywhere else. Join Real Estate Trend Alert now and I’ll send deals and updates straight to your inbox. Editor’s Note: Ronan McMahon appears here courtesy of Pathfinder International, IL‘s preferred real estate advertiser.